Evan Jager (pictured above competing at the 2006 FootLocker Midwest XC) will open his 2018 campaign by competing at the USATF Cross Country Championships in Tallahassee, Florida this weekend. Jager will compete in the men's 10,000m race, which will be the 28-year-old's first competition since the Brussels Diamond League last September. Jager had another strong showing throughout 2017, the Bowerman Track Club athlete netting a bronze medal at the IAAF World Championships in London and scoring his first win on the Diamond League circuit when winning the 3000m steeplechase in Monaco in a blazing 8:01.29. 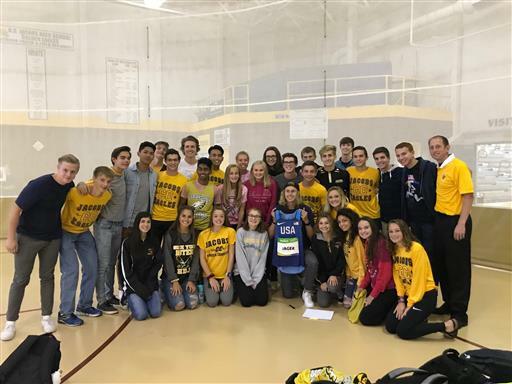 Evan Jager paid a visit to his old high school in Algonquin, Illinois last Friday and left the students with a gift that will prove as memorable as it will inspirational: his uniform from the 2016 Rio Olympics. Jager, who took the silver medal in the men's 3000m steeplechase in Rio, was given a hero's welcome when he was introduced to the students of his alma mater, who got to meet and greet the 28-year-old. "I want to show the kids...that really unimaginable things are possible," he said. For more on his visit, check out this story in the Chicago Tribune and this feature by the Northwest Herald. Evan Jager closed his season with a third-place finish in the 3000m steeplechase at the IAAF Diamond League final in Brussels on Friday night, the 28-year-old recovering from a late-race fall to reach the finish in 8:11.71. On a cool, damp night in the Belgian capital, the early pace was strong, with pacemaker Haron Lagat towing the field through 1000m in 2:40.27. Soon after, as the pace began to slow, Jager moved to the front in search of his first sub-eight-minute clocking, and he led the field through 2000m in 5:24.45. Dogging his heels all along, though, was Olympic and world champion Conseslus Kipruto of Kenya, and Morocco’s Soufiane El Bakkali, who had both beaten Jager into third at the World Championships in London last month. Approaching the bell, El Bakkali surged past Jager, then Kipruto moved around, leaving the Nike Bowerman Track Club athlete to fight it out for third. Kipruto closed in late to pass El Bakkali right by the line to win in 8:04.73, El Bakkali second in 8:04.83. Jager’s race very nearly ended at the final water jump, the American losing his footing on landing and crashing to the track, but he quickly picked himself up and summoned all his spirit and strength to outkick compatriot Stanley Kebenei to take third in 8:11.71. In his first outing since the World Championships in London, Evan Jager finished seventh in the Emsley Carr mile in Birmingham on Sunday afternoon, coming home in 3:57.39. The race was won by Jake Wightman of Britain in 3:54.92 ahead of compatriot Chris O'Hare (3:55.01). Jager, the 3000m steeplechase bronze medalist in London, took up the pace shortly after the 800m mark, reached in 1:57.36, with the American leading through 1200m in 2:59.32. However, he didn't have the pace to match the mile specialists over the final 200m and had to settle for seventh on this occasion. Evan Jager created history for American distance running by becoming the first US man to win a medal in the steeplechase at the World Championships in London on Tuesday night, the 28-year-old Illinois native coming home third in 8:15.33 in a race won by Olympic champion Conseslus Kipruto of Kenya. The early pace was slow, the athletes virtually jogging through the first kilometer in 2:51.81, which left all 15 athletes bunched together. With just more than a mile to run, Jager finally broke, powering to the front and injecting a huge surge. “I was like: Oh my gosh, I hope I have enough left,” Jager said, recalling his thoughts up the home stretch as he hung on for bronze. Kipruto took gold in 8:14.12 ahead of Soufiane El Bakkali of Morocco to maintain Kenya’s stranglehold on the event, with Jager taking the first ever world medal in the event by an American. For a full story on Jager’s feat and to watch his reaction, check out Runner’s World. Evan Jager turned in an outstanding performance to win the Monaco Diamond League on Friday night in 8:01.29, the fastest time in the world this year and his quickest in more than two years. Coming less than two weeks before the beginning of the IAAF World Championships in London, it served as the perfect confidence boost for the 28-year-old Olympic silver medalist. Jager seized command of the race shortly after the 2000m mark, which was reached in a sensible 5:25.40, which means he ran his last kilometer in a blazing 2:35.89. He wound up the pace over the final three laps with relentless power, finally breaking the trio chasing behind with 500m to run. From there, he accelerated all the way to the finish, sprinting to the line to just miss out on the eight-minute barrier, not that he will have been bothered. However, despite beating the best Kenya had to offer on the night, the Bowerman Track Club athlete will not be resting on his laurels over the upcoming fortnight. After all, a late withdrawal from the race was the man who beat him to gold in Rio last year, Conseslus Kipruto, who erred on the side of caution while nursing a foot injury. The pair met afterwards in the mixed zone, with Jager reportedly telling Kipruto that he was sorry not to have him out there and that they’d see each other in London.